Cats are naturally inclined to climb and jump, and sometimes they jump on the countertops. Given that this is the place where we often prepare food and eat meals, it's not only inconvenient, it's unsanitary. Keep reading to learn some of the methods you can use to keep your cat off of the counter. Here are some methods to keep your furry friend away from the countertops. Cats seek countertops because of their natural instincts to climb and jump. They generally enjoy high places because they're warm and comfortable. These instincts are natural, even healthy for your cat, so it's best not to discourage them completely. 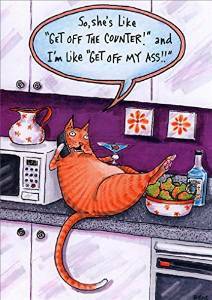 However, not only is it unsanitary to have your cat on the counter, it's potentially dangerous. 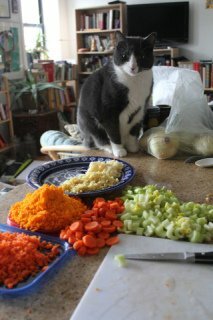 Your cat could eat food that's unhealthy for him or burn his paws on the stove. Some cats like to peruse kitchen counters and tables for food and leftover scraps. To remove this temptation, it's a good idea to keep any food out of your cats reach. Keep counters nice and clean so your cat can quickly realize that he's not even going to find a crumb there. Dishes should be kept clean and free of food. Wash them immediately, or keep them in the dishwasher where your cat can't access them. 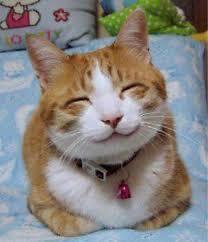 Be sure to feed your cat on a regular feeding schedule so he'll have no reason to scour the counters for food. Running water from the tap. Loose items your cat can play with. Hanging items, such as pots or pans. Observe your cat and if she seems particularly attracted to something on your counter, try to remove it or make it less appealing. 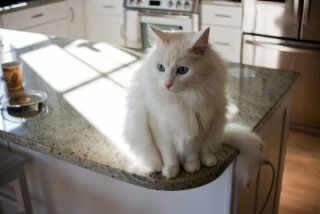 If the countertop alone is enough to attract your cat, you may have to find ways to deter your cat from jumping on it. Cats are sensitive animals, so you'll have to take care during the training process. Avoid negative reactions to your cat in training him; he could develop negative associations to you or begin to fear you. Instead, it's best to find environmental solutions. Many cats learn quickly not to get on countertops if you place some sticky tape on the surface of the counter until the cat is trained. I like Sticky Paws. It is intended for furniture but I find it works well on countertops as well. You can also try scents. Cats dislike citrus scents. A strong citrus smell might be just enough to keep your cat away from the counters. Try buying a citrus air freshener like this natural citrus air freshener, or making a homemade citrus spray. A good spray can be made by combining about 2 cups of water and 1 cup of citrus peels (lemons, limes, or oranges work best) in a sauce pan. Let the mixture simmer over the stove for about 15 minutes. Once it's done, filter the liquid into a spray bottle to create a potent citrus spray. You can add lemon juice or citrus soap to the mixture for an even stronger scent. Spray the mixture onto the countertop after cleaning each day to fill your kitchen with a nice citrus scent and to discourage your cat from jumping on the counter. Another thing you can try is placing aluminum foil over the surface of the counters. Most cats dislike the way foil feels on their paws, so they'll likely turn around and jump off. Many people use squirt bottles to keep their cats off the countertops. While this shouldn't hurt your cat, he could become fearful of you. He may also only associate the method with you being around, doing nothing to prevent him from jumping on the counters when you're gone. Though it may do the trick, it's probably not the most effective method available. When your cat does jump on the counters, remember never to hit or yell at him. Don't push him off the counter, he could slip and get hurt. Lift him off instead. 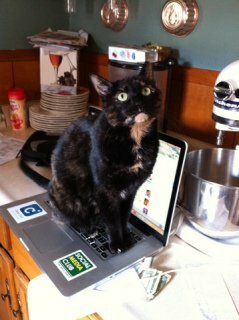 If you're using environmental methods to keep your cat away from the counter, avoid using devices that could cause physical harm to your cat. 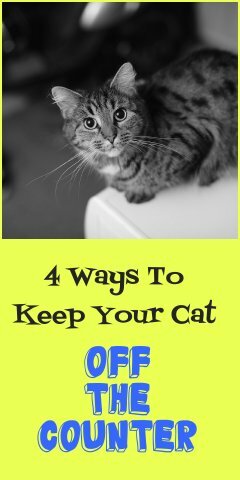 With these 4 proven methods, your cat will be off of the counter and jumping in more appropriate places. Remember to always reward your cat for good behavior. Then, you and your cat can be happy together. Originally published September 2012 and updated March 2017.